SharpSpring is a marketing automation software that builds buyer personas to engage leads at critical points and notify sales team members. Features include behavior-based email, form builder, full marketing automation, anonymous visitor ID, built-in third-party CRM, campaign tracking, blog and landing page builder, and analytics. SharpSpring sends every lead specific information at critical points in their unique buying process, notifying salespeople to act at just the right time. Customize campaigns with the drag-and-drop editor, deal stages, filters, automated forms and custom CSS. Behavior-based tracking provides analytics into what motivates and sustains each click. SharpSpring integrates with a number of CRM platforms, allowing users a two-way data sync between SharpSpring and the 3rd-party CRM of choice. Sales team representatives receive a list of each day’s top leads, and when to act to convert them to sales. The SharpSpring platform allows user to build landing pages and funnels to transform visitors into leads. The WYSIWYG interface allows user to create pages with point and click components, and deliver web content that changes based on visitors’ interests and attributes. Reporting allows users to share metrics with team members. SharpSpring integrates with many products and services that extend the power of marketing automation. SharpSpring tracks customers across paired applications and offers companies a customer profile that connects dots of where they’ve been. Universal CRM, CMS and form builder capabilities ensure that Sharp Spring is able to integrate with platforms such at Shutterstock, Salesforce, Zendesk, WordPress, GoToMeeting, Optimizely, 123ContactForm and many more. 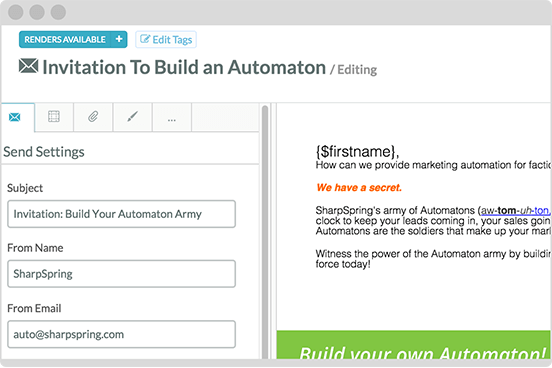 Using customizable automation rules, SharpSpring sends targeted content and emails based on individual interests. Not sure if SharpSpring is right for you? Use our Product Selection Tool to compare other Marketing Automation solutions. Have questions? Call one of our unbiased Technology Advisors for a free consultation. Learn everything you need to know about SharpSpring. Our experts will reach out to you shortly.